Proraso Classic Eucalyptus Shaving Cream transforms your daily shave from a boring routine to a special event. Invigorating and luxuriating, this creamy lather provides a superior glide surface for a close shave without irritation. Use with or without a shaving brush. Eucalyptus, Coconut Oils, Lanolin and Glycerin are combined in this famous and traditional formula. The enriched Glycerin base soothes the skin and promotes a healthy complexion. 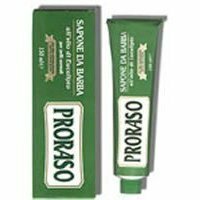 The classic and distinctive green tube reminds you of a time when shaving was a time honored ritual. Tube can conveniently stand on its top. Made in Florence, Italy for generations by the same family. 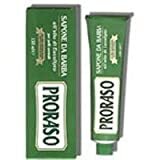 For over 50 years, Proraso has been the leading shaving brand for men in Italy. Without question the best shaving product in my experience. Used with plenty of hot water, a double edged razor, and a brush (up and down strokes are best) and you can expect the closest, most comfortable shave ever. The scent is manly but not macho, and is very light in any case after you wash it off, and you don't need to use aftershave either. Wonderful. Tried it for the very first time this morning. A pea-sized amount makes enough lather to shave.